The sewers came to be in a pretty unspectacular way: we needed to get the most out of the map surface, so a network of tunnels would help give the map a bit more room. On top of that it would give people an alternate route to travel if the surface proved to be too crowded with rival faction members. After all they can't snipe you from The Rocket if you're underground. This came with some complications though, mainly: Why travel on the surface of the map if you can just always use the tunnels to get everywhere unseen.... We came up with something for that. For the last few weeks you may have caught a glimpse of one of the splinter builders laughing in chat about how "this is going to be soooooo brutal!". Well we were talking about the underground area of the Splinter map. The thing we discussed most in chat were obviously the horrors players will face. The traps that were built in the sewers are not easily outwitted minecraft mechanics, rather they are Craftbook fueled traps. This plug-in gave us a really wide range of options that didn't require bulky redstone contraptions. A block, a sign and a signal is more than enough. This allowed for some really complex but compact traps that can catch anyone by surprise, even those that built the sewers! But don't underestimate the vanilla traps, there's plenty of ways to fall to your death or drown without us ever coming near craftbook or even redstone. The careless adventurer won't have a great time in the sewer at all! However the smart tomb raider or pursued rogue will have a blast! Pushing rivals into traps or leading them into a room that slowly fills with lava is something that's very much possible. And then there's the treasure! Yea, you heard that right. There will be pre-placed treasure in the sewers (and on the general map for that matter) but the good loot won't be easy to reach. The chests are in obscure corridors, hard to reach spots in pits or in plain sight (well with about 3 traps in the way). We went with the treasure route to give explorers a boost, and hopefully included enough to last about a month. In general our idea was that facing danger like this should also have a reward besides controlling the sewer. These treasure chests and their contents should provide just the boost a starting faction could need, on top of giving you a personal upgrade in power.... If you manage to survive the trip back that is. But yeah, treasure is nice. But on top of that there's still the continues hordes of mobs that spawn in the sewer and the central dome to take care off. You want that precious portal under your control right? Oh that's right, there's also one portal to capture and defend in this hellhole. And to get there you're going to have to focus hard and make it across to the hanging platform in the center of t he reverse dome in the middle of the sewers. Getting to the dome is quite possible without getting (very) lost, But then you still have to jump your way across to get to the middle platform and conquer the resources your faction needs. We went with a portal here because it's a highly defended area by nature, but hard to defend once rival factions manage to break trough the traps and horrors that lurk beneath. So this pretty much concludes the sewers, we had huge amounts of design space here but in general this area isn't going to be the place that you will be spending the majority of your time in. Anyways that's it for this Log, next time we'll be discussing the surface area and design choices we employed there! Pictured here are the sewers we talked about, the central dome obviously being central. Now this may not look all that expansive, but then again it's not filled with mobs and pitch black. And there's also a lot of less visible redstone lamps all over the map indicating redstone / craftbook contraptions. Attached to this post is another picture that shows a small part of the inner circle jumping challenge. Obviously we're not gonna show everything because that would ruin the surprise hehe. Does it come with a custom texture pack, too? It doesn't, unless someones up to make one. I don't have the patience to do that. But it would be cool. 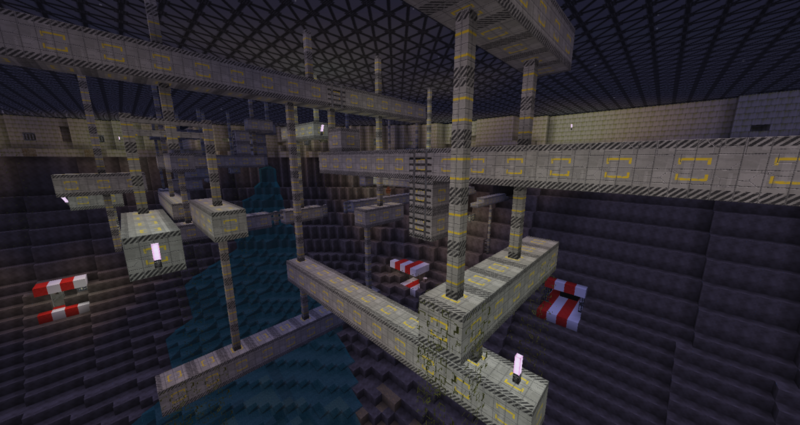 That last screenshot is just me using my silly scifi texture pack.